So I was experimenting with recipes as I like to do only when I have surplus food :D. Since it is the Salah season I've had a bit of extra ram to experiment with. 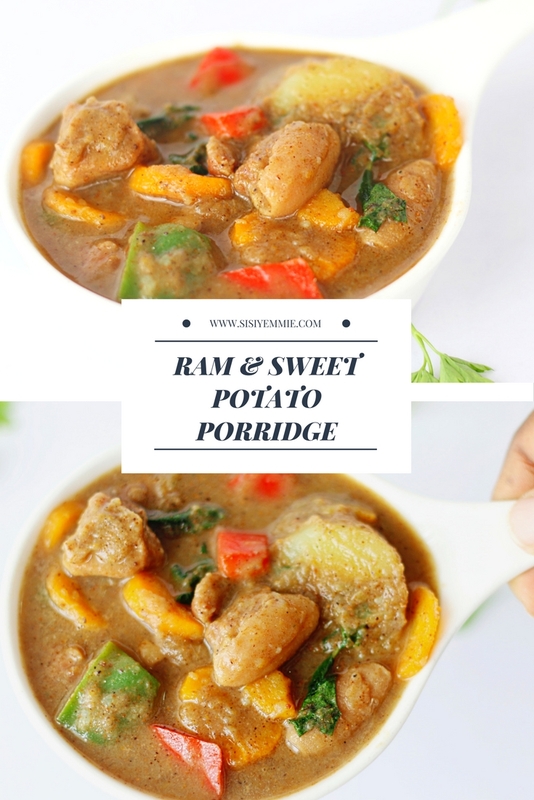 Typically I would make a soup with it or Peppersoup or Ram Stew, I love Ram, but this time I wanted something else. I made a Sweet Potato Peppersoup/Porridge - It is a delicious meal, it tasted just as I imagined in my head that it would taste. The sweetness of the sweet potatoes and the earthy flavour of the pepper soup spices is just a delicious combination. You have to try it! If you are not subscribed join the family by clicking HERE and let's be friends on Instagram HERE . Cut Ram into byte sizes and wash. Transfer to a pot, add onion, salt, seasoning cube, stir to combine and cover it to steam. Do not add water yet, the ram would release it's own juices, so let it do that for about 10 minutes. After 10 minutes, add pepper soup spices, carrots, sweet potato and 3 cups of water. Cover and allow to cook. Add scent leaves, turn off the cooker and allow to simmer. The steam will cook the scent leaves. SiSI Dear, it's like you omitted the sweet potatoes as you didn't mention when you add it in the coooking process . At what point please? It looks very nice. Have you tried potatoes & turkey soup. It's similar to this. It taste really good too.